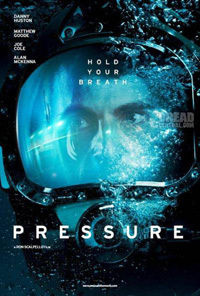 This claustrophobic British film takes the viewer to the depths of the ocean, straight to the bottom, along for a breathless ride with a crew of deep sea welders tasked to fix a damaged pipe. They are hoisted down inside an unpowered submersible bell, life support attached to the mother ship via an umbilical. This routine job turns disasterous and deadly when a vicious storm on the surface sinks the ship to which they're attached. With no engine to surface, no communication, no-one aware of them being stranded, limited power and oxygen, the scramble for survival begins. Swimming 100s of meters to the surface is not an option as the sudden pressure change will lead to potentially deadly decompression sickness (aka the bends). The group of welders comprise diverse personality traits (gunning for full dramatic conflict potential), ranging from a religious man and a boozer, to a rookie with a new kid and a man with an event from his past still haunting him. This is no new underwater narrative situation, with many expected outcomes, but it is executed competently enough to keep many viewers tense. This classic survival countdown tale was co-written by actor Alan McKenna. PS. After Wolfgang Petersen's 1981 WWII U-boat drama Das Boot (The Boat), decades later it still remains unrivaled and will take a lot to erase its reference when dealing with a subject like this.